Extra Roomy Everyday Knee Highs 6 Pair Pack, Hosiery. 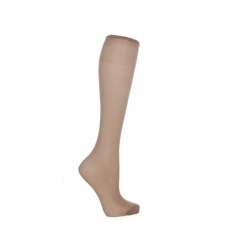 Our exclusive Everyday Knee Highs are specially designed for people who find normal fitting hosiery too restrictive. Unlike ordinary hosiery, they’re made with lots more material in the feet and legs for a generous and comfortable fit. And with 6 pairs in each pack, they offer excellent value too. Available in Black, Mink and Natural. Brilliant quality product at an excellent price. Bought these for my mum as she has swollen legs. These are very comfortable. Fast dispatch and free postage. Very satisfied, thanks.